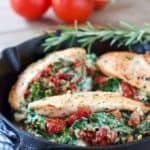 Chicken Breasts Stuffed with Ricotta, Spinach and Sun Dried Tomato - Under 30 minutes to make this yummy, gooey stuffed chicken recipe! Wrap frozen spinach in paper towel and squeeze until all excess liquid is released. In small bowl, combine ricotta, spinach, egg, garlic, parmesan and a pinch of salt and pepper. (taste...more salt? more pepper?). Slice open chicken breasts like a book. Cutting horizontally but not all the way through. Sprinkle with salt and pepper inside and out. Place 2 heaping tablespoons of ricotta mixture inside opening of each chicken breast. Top with a sprinkle of sun-dried tomatoes. (you may not use all the ricotta mixture. You can place in a ramekin and bake...it makes a fabulous dip!). Heat oven safe skillet to medium high heat. Add olive oil. Carefully place chicken in skillet. Brown 4-5 minutes on each side. Transfer to oven to continue to cook. About 10 minutes or until chicken reaches 165 degrees internally.